A class of London Fancies was presented at the 2017 World Show in a section officially known as Nouvelles Race en étude (pas de medailles), in other words for appraisal rather competition. This is part of COM’s process of evaluating a new breed before it can be recognised officially. I’m not going to go into the details of the process here, but it starts with a) the submission of a technical description of the breed (the show standard) and b) a display of specimens that conform to that standard. The process takes a minimum of three years; there are many obstacles along the way. The most recent graduate familiar to British readers was the Irish Fancy. The aim, of course is to recreate the London Fancy as described in nineteenth century bird books: a dark bird that moulted out clear at the first moult, apart from its wings and tail. It’s not a great photograph, but the bird at the head of this article has those essential characteristics. There are improvements to be made in the darkness of the wings, tail, beak and legs, but nevertheless this is a good example at such an early stage in the breed’s development. Unfortunately, the new London fancy fell at the first hurdle. The common refrain (all from unofficial sources) was that most of the birds on display were merely variegated canaries and therefore did not meet the standard. Readers who recall my article on the London Folly will understand the problem. All is not lost, but there will be a delay before the process can be restarted, and I hope the London Fancy Canary Club will use this time wisely. It needs to acknowledge that there are two different strains of the ‘new London Fancy’, but that only one of them has a chance of being recognised officially. I will explain why in a future chapter of my series on variegation. My apologies for the quality of the images. I would like to thank everyone for their comments; a wide range of information and opinion. Well worth reading. well the second example of the bird at the show is a variegated bird there is no question about that. I suppose if the first bird could be shown again next year it would be interesting to see how the wing and tail feathers molt out. This would be a kind of before and after situation and a better chance to establish the bird. Remember it’s not that long ago when the Borders had classes for six pointers 4 pointers two pointers if you know what I mean. I stated when I was a young lad my late father had what he told me London Fancy canaries and to be honest I have to acknowledge the yellow was very deep as was the wings and tail??? This is 1954 I can still see these birds and their beautiful colour. First of all I congratulate you for the nice and comprehensive articles that you have been publishing in the Fine Spangled Sort. I started to follow the page since last year World Show in Portugal when a mutual friend and also OMJ judge that was judging close to me saw my enthusiasm with the Lizard and London breeds. In fact I started to breed Lizards 20 years ago do the the London, because after studying the London Fancy and collecting all the available information about the breed in British and other old books I was wondering if it would be possible to recreate his cousin Lizard profiting from an hazardous mutation in the Lizard. Since them I’m following the evolution and the steps that some breeders are trying to recreate the breed. I visited even some of these pioneers, like Sergio Palma in Italy to see the improvements that were made. Although I always believed that the breed would only come from a Lizard mutation I believe that the efforts that were made to get the London back through other crosses can have success if we could fix at least some of the important characteristics like the black tail and wings and dark feet and beak. Of course that another important point is that, as a melanic bird, the under-feather must be dark. I had the opportunity to judge at this World Show and, because I’m very enthusiastic about the London Fancy, I was following my judge colleagues that were analyzing the London birds and I can say that the problem has nothing to do with the presence of some variegated birds (because all the London fancy fans know that most of the London had, and will have, variegation on the bodies and only a small part will have completely clear bodies). In my point of view, and because I discussed this with other judges, I can say that the only aspect that contributed for the negative global evaluation was that only 2 birds had dark feathers on the tail and wings. All the rest had white feathers in the tail and, at least for me, this is a major and very important standard request and need. I had also the opportunity, after asking permit to Simon, to see the under-feather of 2 birds and I saw that one had dark feathers but the other had lipochromic feathers. So in my opinion the London birds that will be presented to the judges in the future must have at least these 3 items according the standard – dark (as black as possible) feathers in tail and wings, dark feet and beak (as black as possible) and must genetically have this features. At least the wings and tail feathers, the feet and beak must be so dark as his cousin Lizard has on the show bench…it would be strange if someone could present a Lizard with lipochrome feathers in the tail or wings. The question of the variegation is not an issue as we all know that to have nice clear body birds we’ll have a lot of variegated birds…and maybe that even contributed for the reduction in the London fancy in the early 1900’s. I hope that all the London breeders can work towards this goal according the standard. The number of feathers is not correct in the pic of Mr. Waller’s bird at the Cristal Palace. Claws are white. Thanks for that update Huw. I was present at the presentation of the breed and was asked to translate into Spanish the presentation made by Simon Tammam. I can confirm that at least seven of the twelve birds presented were judged to be “Non Jugé” ( i.e. 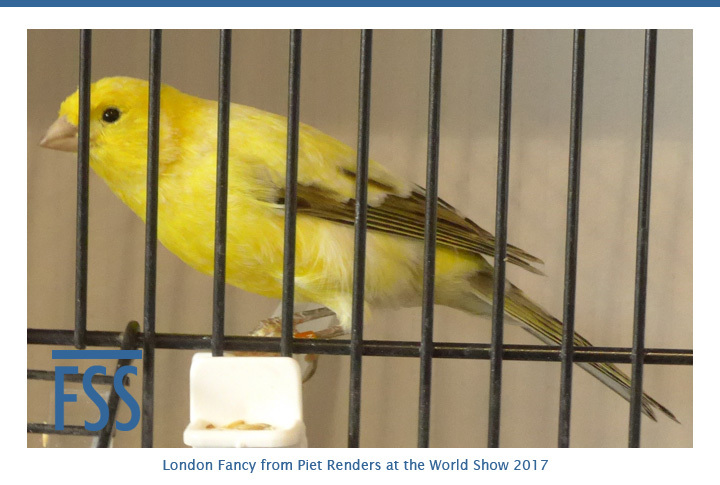 that could not be judged as these were considered “atypical”, not truly representative of the breed) by the OMJ representative for the type Canary section. Additionally, it is my understanding that the five judges (each from a different country of COM) afforded the birds on display a score of well below the average of 87 points that is required in order to proceed further on the recognition process. Indeed, what can be the result if more than half of the London Fancy canaries presented in Almeria showed white feathers in tail and/or tail ( some had all white tail feathers) and varying degree of variegation in what must be a clear body. Much as I for one applaud the efforts of those breeders intent on bringing back the London Fancy, and encourage them to continue in such a pursuit, it appears to me that there is still a long way of hard work before the new London Fancy may be approved by COM as a new breed. My sincere best wishes in such a quest. Trying to create the london fancy by crossing a lizard with a colour canary will only create variegated canaries. And as everyone knows variegated canaries have no fix patern in there genes. Which means that the offspring will be for many years variegated with no predictible black feathers on the wings and tail and no black legs and nails as disired for the london fancy. A fancier has to count on luck, this is not the way to create a race. Colour canaries is not the way to go I would have thought as it’s foundation is from an outcross to far away from creating a new model canary bird. I feel they will never succeed going in this direction. I would try and bring the border canary back in type to about thirty years ago maybe a bit longer and then pair the clear capped gold lizard to a clear yellow hen from the border side and try this direction. If I were younger this is the way I would go and for sure forget completely the colour canary direction.